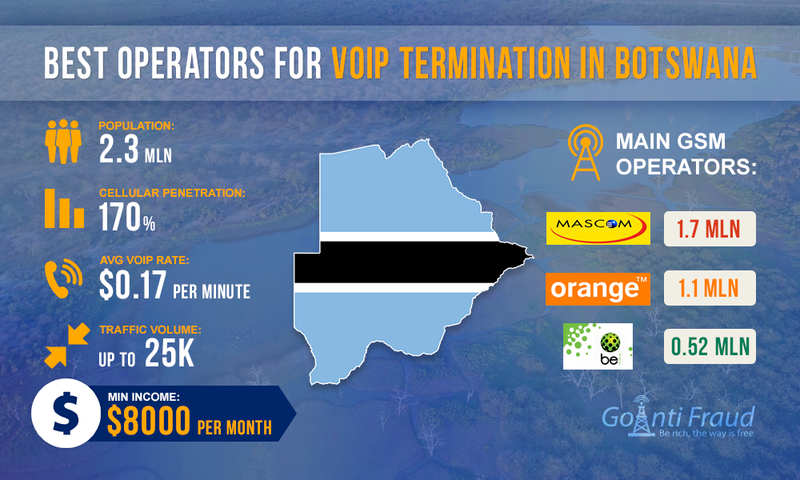 Botswana is a promising direction for the VoIP GSM termination. Like other African countries, it attracts expensive international calls with cheap local calls. You can make good money off the difference if you reliably protect SIM-card from the antifraud lock. In addition, it is important to choose the right numbers to directly land calls to Botswana. They should belong to the largest GSM operators. The country has 3 cellular providers, of which Mascom (1.7 million users) and Orange (1.1 million subscribers) provide the largest market coverage. They are both suitable for call origination and termination in Botswana, with proper choice of tariff plan. BeMobile has 0.52 million people subscribed, providing not such a large amount of international traffic. SIM-cards in Botswana are inexpensive - about $1. But their purchase requires an identification document with a photo. To purchase numbers that will be used in VoIP termination, it is better off turning to dealers. They are engaged in the supply of SIM-cards specifically for this business in large volumes. Including the cost of their services, the cards will cost a bit more expensive but this is the easiest way to purchase the required quantity of numbers to terminate calls. With regard to the voip value, one minute of conversation via Orange is more expensive, although the operator provides less traffic than Mascom. Using the SIM-cards, you are can make large profits (voip rate is $ 0.19 per minute) in theory. On the other hand, the use of Mascom numbers will increase your chances to have a lot of traffic paid off because its coverage of the market is greater. The voip price per minute of the operator is $0.14. If we talk about the cost of calls within the country, Mascom offers more favorable conditions. A minute conversation will cost about $0.05, while the Orange tariff is about $ 0.08. If you have a 16-channel elastix voip gateway running for 4 hours a day, you can make an average of 7 thousand dollars, terminating Mascom traffic via its SIM cards (considering the average lifespan of cards of 7 days). VoIP traffic termination via Orange, with its packages and under the same conditions, will make you a profit of about 8.6 thousand dollars. Of course, another important criterion is a level of performance of antifraud systems. As a rule, the larger the operator is, the more money it invests in the development of analytical and calling systems that monitor the call origination and termination. GoAntiFraud will help you protect SIM-cards from the fast lock. Connecting your VoIP equipment to our service, you will have access to efficient tools for the simulation of human behavior in the GSM networks. We provide a complete solution for a lucrative termination, as well as help to set up the operation logic to handle the peculiarities of a particular country.